OneSearch provides access to the 8 million items previously found in the SDSU Library Catalog. Login to OneSearch to renew your book online. Where and how you can return your book. All recalling/placing holds on checked-out books. How you can borrow from another library. Log in to view what books you have checked out, check the status of your holds and other requests, and renew books. Use your SDSUid to access library resources. Information on book return locations and returning by mail. To reserve an item currently checked out by another borrower, you may place a Hold on it, either online or at the Circulation Desk. Can't find a book in the stacks? You may place a Request on the item while logged into OneSearch from any terminal within the library and we'll search for it. How to log into My Account and renew materials. A chart of the loan periods and the number of renewals permitted, which vary according to patron, material, and location types. Information on how much library fines are and how to pay them. More info on appealing your library fine and an online form to fill out your appeal. 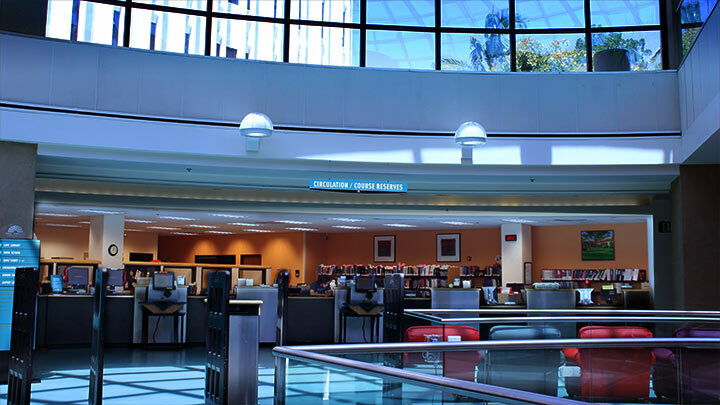 The Library holds material on course reserve for faculty across campus. Students can check most of these books, periodicals, and multimedia out for loan periods determined by the course professor, at the Circulation / Course Reserves desk.